Our Spring Break travel series continues! Once you know where you are headed, you can still save some extra money by packing strategically. Packing smart is one of the most important ways you can save money on your next vacation. With baggage fees soaring, learning how to pack light is essential. 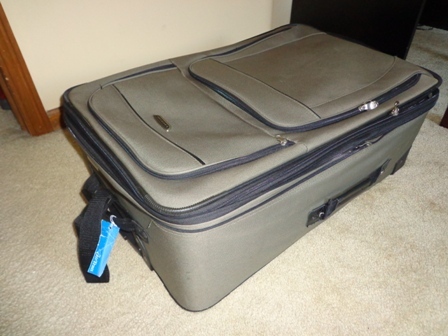 You can avoid having to pay for checked baggage or even worse, pay for a suitcase that exceeded the travel weight. Also, if you pack smart, you will eliminate having to purchase overpriced things you may have forgotten. How much you pack even applies during a road trip or camping trip since the excess weight can weigh you down, raising your price of gas. Make a check-list in advance. With ample time before your trip, start a checklist either on a computer document or in a notepad. Allowing yourself enough time before your trip will let you acquire any items you might not have on hand and add items to the list as you think about them. Doing it in advance is especially important for items you don’t have. Before I went on a long road trip, I made a list of everything we needed. Once I looked at the list, I was able to borrow a few things from friends and family. And for the things I couldn’t borrow, like a tent, I was able to search for sales and deals and do research to find out what item was the best for my money. Plan before you pack. Besides a check-list, there is more planning that needs to go into packing. Research the weather to see what type of clothes you should be bringing and what you can leave behind. Think about the activities of your trip before you pack. An adventurous camping trip requires far different clothing and other items than if you’re planning on going out to nice dinners or sitting by a beach all day. While you’re planning, inquire if there is a laundry facility where you are staying. I was shocked at how many campgrounds and hotels had an on-site laundromat while I was on the road. This can allow you to pack less clothes. Bring versatile clothes. The clothes you pack for your trip should be versatile in many ways. First, pack clothes you can easily layer and work with temperature fluctuations. Second, pack clothes you can wear multiple times. Try packing outfits you can mix and match so you don’t have to pack seven different outfits for seven days. I like to pack outfits I can wear all day and night. For day, I make sure it’s comfortable to walk around in and for night, I can just add an accessory to make it more dressy. Pack your own laundry kit. The best way to reuse outfits is to pack a laundry kit. Not to the point where it’s unhygienic, but it’s fine to reuse your clothes for an additional day. When I’m traveling, I carry a Tide pen in my purse. This way if I spill some wine on a shirt or have a grass stain from sitting on the ground, my outfit isn’t ruined. I also like to bring a travel size Febreeze spray to freshen clothes up. When I’m camping or going on a road trip, I also pack a wrinkle release spray that gets rid of the wrinkles. Shoes: Pack shoes that are comfortable. Even if you don’t think you’ll be walking often, nothing is worse than blisters or sore feet on a vacation. Also pack shoes you can wear with many different outfits and for several purposes. Jewelry: A watch is a great idea to help you keep track of time. Keep all other jewelry to a minimum, and bring pieces that you can mix and match and wear with many outfits. Instead of necklaces and bracelets, opt for a scarf. A scarf can be worn in many different ways, be used to warm you up, and takes up little room in your suitcase. Purses: I usually bring a large purse if I’m traveling by air so that I can put more belongings inside of it. I then bring an additional smaller purse or wristlet for carrying around my camera, ID, and essentials. Skip things you don’t need. Before you place anything into your carryon or suitcase, ask yourself if you really need it. To best answer this question, it may take a little research. If you’re staying at a hotel, check their website and call to see what they offer. Besides soap, shampoo, and conditioner, I’ve seen hotels offer all kinds of toiletries like toothpaste, toothbrushes, razors, deodorant, and hair spray, and even other items like flip flops and robes. If a hotel has a business center, you can eliminate packing your laptop. Besides hotels, campgrounds can offer items that would help you eliminate packing them as well. Last time I went camping, I packed a small grill and charcoal to cook while we camped. When I got there, I realized each camp site already came with a grill, and I didn’t need to bring mine. Campgrounds can also offer games, pool toys, beach gear, and laundry facilities so check ahead of time. Make your own travel size toiletries. If your hotel doesn’t offer toiletries or you’re not going to a hotel, you’ll need to take your own. But travel sized toiletries are not worth the money. They may seem inexpensive, but compared to the regular size product, they are a huge mark up. Instead of buying travel size items, buy the regular item. Many stores have travel sized, reusable containers. Just fill them up with your lotion, hair products, and body wash. If you’re planning in advance or always thinking about your next trip like I am, you can acquire your travel size toiletries for free. When you stay at a hotel, ask for extra toiletries to keep for next time you travel. Next time you’re at the dentist, ask for a few extra miniature toothpastes, mouthwashes, and floss containers. Beauty counters at department stores often offer free samples of face washes, lotions, and other face products that are the perfect size for travel. Hair salons can offer free samples of shampoo and other hair products. Keep a plastic bin full of your miniature products so you’re ready for your next trip anytime. What are your packing secrets? How do you save money when you’re packing?